It’s one of those awful double standard truths of Hollywood: Male actors can get away with conventionally unattractive facial features that would have their female counterparts driven from the world of TV and movies by pitchfork-wielding mobs. 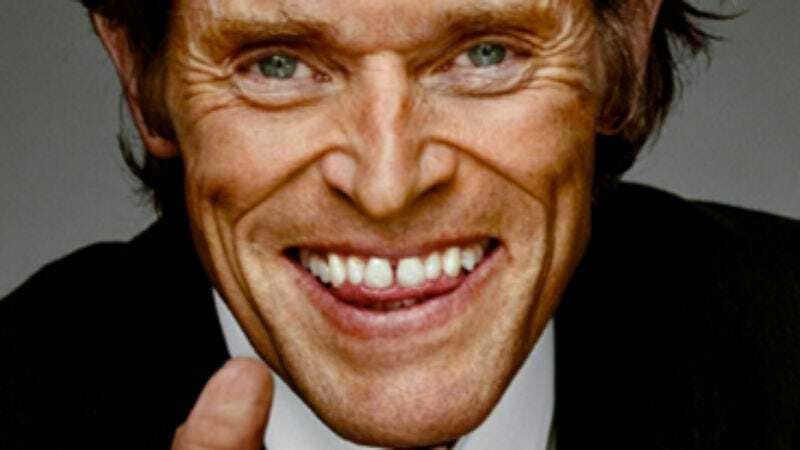 Take Willem Dafoe, for instance: A wonderful actor whose craggy, heavily browed face and wide, soul-devouring mouth only accentuate his appeal as a villain or pity-invoking supporting player. But if Meryl Streep went out in public with a comparable set of gnarly looking choppers, she’d be hounded into the ocean by a pack of wild dogs. And so, in the fine tradition of Chicks With Steve Buscemeyes, Todd Spence at Break has done God’s work, reminding us all of our shallowness and superficiality by replacing the mouths of popular young actresses, including Emmas Watson and Stone, with Dafoe’s gap-toothed murder maw. We can only hope this is just the next step in Hollywood and the Internet’s ultimate goal: transforming every young actress into a composite of various character actors’ faces, thus relieving studios of the need of ever casting another woman in anything ever again. You can see Spence’s Dafoeification of other actresses, including Amy Adams and Scarlett Johansson, here.